The first and most common Amazon SQS task is creating queues. In this tutorial you'll learn how to create and configure a queue. 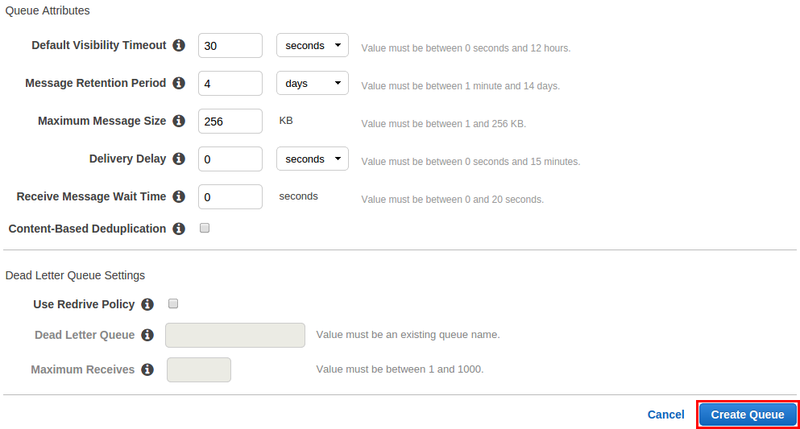 To configure your queue's parameters, choose Configure Queue. When you finish configuring the parameters, choose Create Queue. For more information about creating a queue with SSE, see Creating an Amazon SQS Queue with SSE. The following example shows the Content-Based Deduplication parameter specific to FIFO queues. The Queue Type column helps you distinguish standard queues from FIFO queues at a glance. For a FIFO queue, the Content-Based Deduplication column displays whether you have enabled exactly-once processing. Your queue's Name, URL, and ARN are displayed on the Details tab. // If the user doesn't provide a MessageDeduplicationId, generate a MessageDeduplicationId based on the content. You can use the AWS CloudFormation console and a JSON (or YAML) template to create an Amazon SQS queue. For more information, see Working with AWS CloudFormation Templates and the AWS::SQS::Queue Resource in the AWS CloudFormation User Guide. Copy the following JSON code to a file named MyQueue.json. To create a standard queue, omit the FifoQueue and ContentBasedDeduplication properties. For more information on content-based deduplication, see Exactly-Once Processing. Sign in to the AWS CloudFormation console, and then choose Create Stack. On the Select Template page, choose Upload a template to Amazon S3, choose your MyQueue.json file, and then choose Next. On the Specify Details page, type MyQueue for Stack Name, and then choose Next. 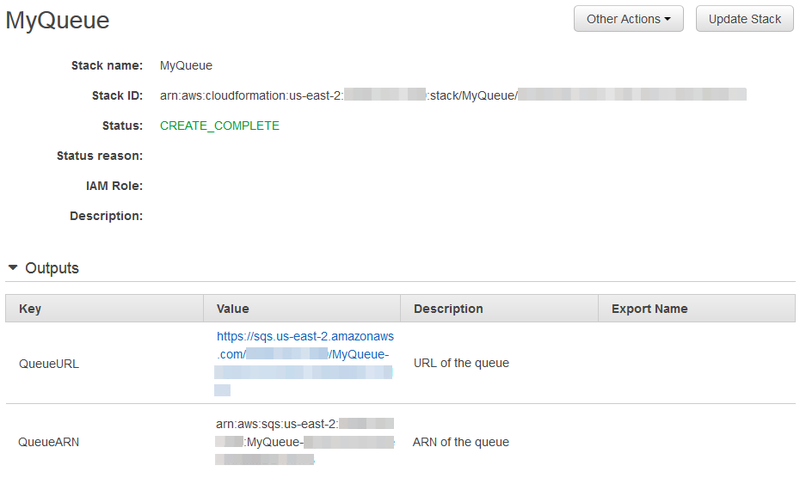 AWS CloudFormation begins to create the MyQueue stack and displays the CREATE_IN_PROGRESS status. When the process is complete, AWS CloudFormation displays the CREATE_COMPLETE status. (Optional) To display the name, URL, and ARN of the queue, choose the name of the stack and then on the next page expand the Outputs section.